May is unofficially the kickoff to the start of the summer weather season. May is the month in which severe weather peeks across the US in terms of tornadoes, large hail, and damaging winds. Those living in more temperate areas begin packing away the blankets and start turning on the AC. Snow fades to just the highest elevations in the intermountain west. Even tropical cyclones can pose a risk to the US as May is the busiest “off-season” month of the year. So what were the big headlines this May? Let’s find out. While the overall weather pattern in May was ever-changing, when it warmed up in the eastern US, it got downright hot. 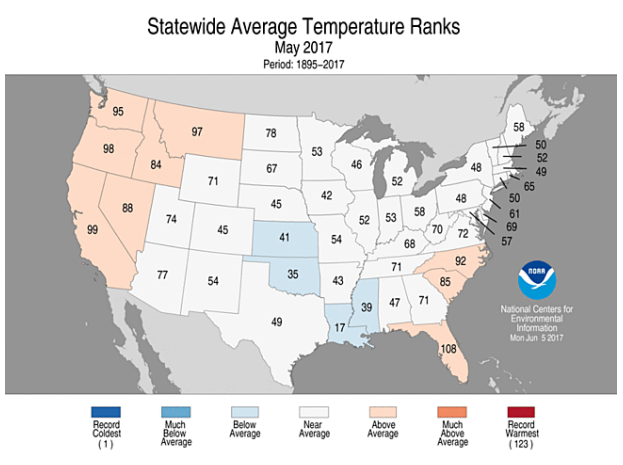 The epicenter of the heat was focused over the coastal Southeast where Cape Hatteras had its 3rd warmest May on record. Twenty-seven of thirty days this month were above average. Sixteen of those days had high temperatures above 80 degrees. Another eleven days had low temperatures fail to fall below 70 degrees. This was the 3rd and 4th most respectively for any May in Cape Hatteras. Their typical high should be around 75 with lows in the 50s and 60s. And it hasn’t just been a warm month along the coast. 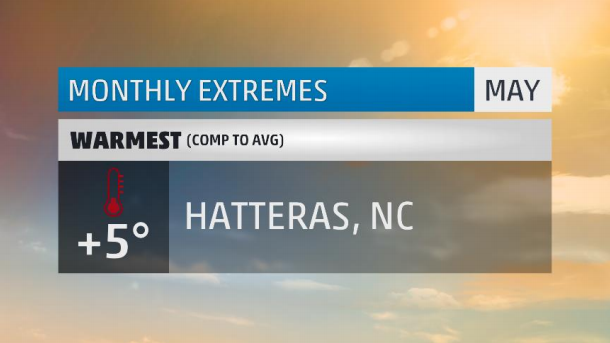 Hatteras is experiencing its 2nd warmest year on record through the end of May. Seems like a great reason to take a dip or two in the ocean. Elsewhere, due to the topsy-turvy nature of the jet stream pattern, not many place where able to hold on to prolonged heat or cold this May. 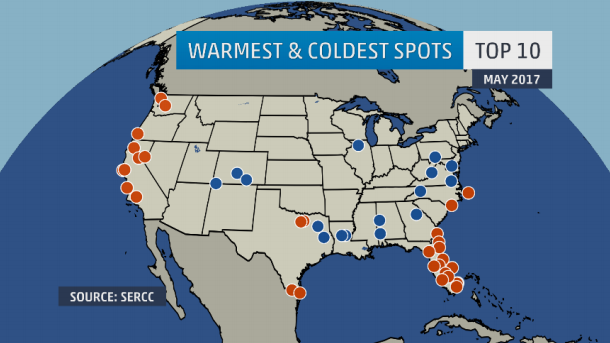 As a result, not too many places experienced a top 10 in terms of extreme temperatures. Those in the heat this month: Florida and California. Florida’s heat is due in part to the on-going drought which gripped much of the state with high category impacts. Out west, a ridgier pattern at the beginning and end of the month helped to pop temperatures and keep those along the coast sizzling. The US as a whole finished right near statistical average in terms of temperatures and zero states set a record for warmth. The same story can be said for cold. 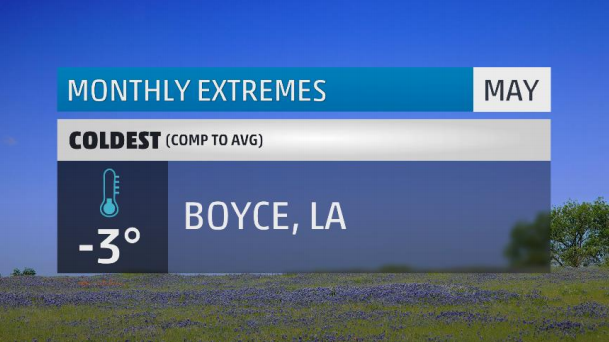 Boyce, LA was one of the few locations to set a record for warm or cold temps this month. In Boyce, it was the coldest May on record with 26 days of below average temperatures. With a typical average high of 84 degrees, 17 days failed to even reach 80. Thirteen days had lows dip below 60 degrees – another record for May. The main reason for the cooler weather was a persistent rainy, damp, and cloudy pattern. Boyce finished the month nearly 1.5” above average in the rainfall department. Cooler than average temps were felt along the Gulf coast and through the nation’s heartland as active weather helped to keep a lid on temperatures. As you can see by the sea of white on the map above, a majority of the US was neither warm nor cold this May. Goldilocks would appreciate a May like this. An active pattern helped Montgomery climb to the top spot in terms of rainfall this May. Of May’s 31 days, 17 were wet in the town which refers to itself as “The Gump”. One particularly wet day late in the month produced a whopping 8.15” – a record for the wettest May day and the 4th wettest calendar day. 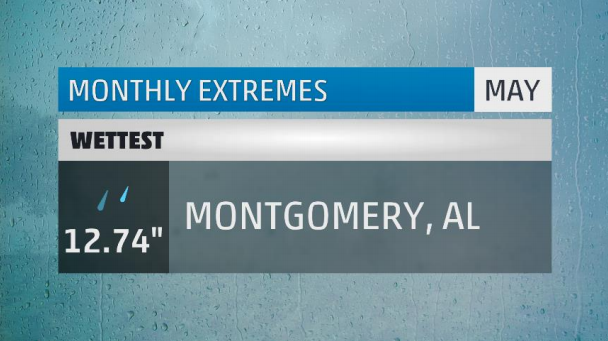 This was also the wettest May in Montgomery on record coming just shy of 10” above average. The heavy rain helped to ease drought conditions brought on by an exceptionally dry winter season. For the east, May was a waterlogged month. A parade of systems with higher-than-average moisture content brought days and days of rain from Atlanta to Augusta. All in all, twenty locations east of the Mississippi River had their wettest May on record! Yes, it does snow in May. Winter Storm Valerie brought feet of snow to the intermountain west this May with Dillon, CO being the snowiest of the official observation stations. The 28.5” of snow they saw was an impressive 23” above their May average. 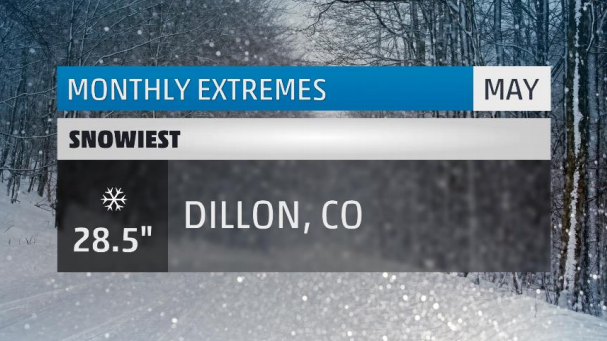 This was the second snowiest May in Dillon’s history. Elsewhere in Colorado, ten non-official stations picked up over 40” of snow in May. The big winner was the gold rush town of Ward which saw 46.3”! The question now becomes will we see snow into June? 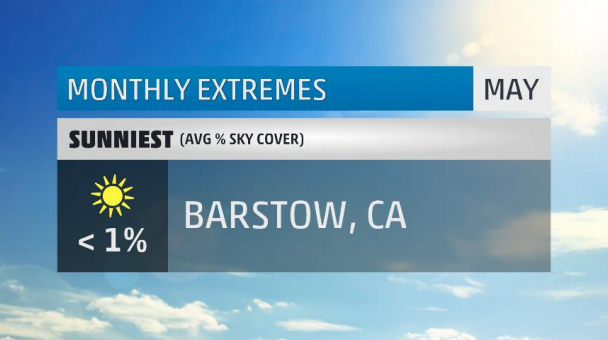 With an almost carbon copy of last month, this month’s sunniest winner is, once again, Barstow, CA. There’s not much to say that hasn’t already been said about Barstow. The desert city in southern California is no stranger to dry, sunny, hot stretches. This May was no exception to that. Zero days in May had greater than 10% total sky cover and no rain fell from the sky. Their warmest temp was 102 while their coldest was 44. That’s an impressive 58 degree difference that you’ll only find in desert locations. We’ll check back next month and see if they can make it a three-peat! Like most of the eastern US, the city of orange was mostly gray. In May, Syracuse saw zero sunny days. Every single day had at least 51% sky cover with 17 of them being virtually overcast. There were 22 days with measurable precipitation that yielded a stretch of 5 straight overcast days. 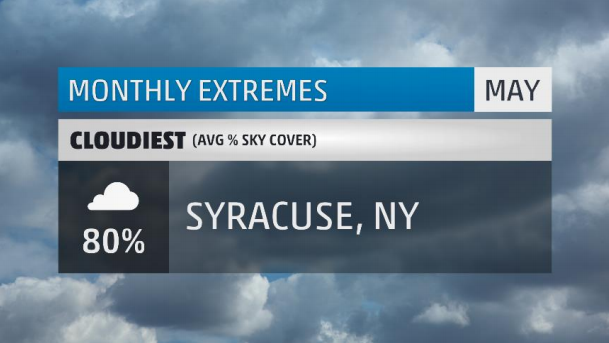 Typically for the ‘Cuse, their cloudiest month is January with nearly 76% sky coverage on average per day. The least: August, with 36%. There you have it, the extremes for the month that was May 2017. Make sure to check back next month to see what June has in store. What weather extremes did you face in May? Let me know in the comments below. Thursday night there was lightening in the sky, one could see the clouds. Sleep took over me, and when I woke up that morning I could see the ground was wet. The weather has been in the 90’s mostly this week, and it was so very, very warm. Too warm for comfort. We saw WAY too much rain in S.E. La., some roads flooded, closed. More rain in the forecast. Beautiful cloud formations though, some awesome lightning too!